i wouldn’t call myself a video game addict exactly (well, maybe there’s the teeny tiny exception of rock band), but i do enjoy them and associate some fond adolescent memories with them. 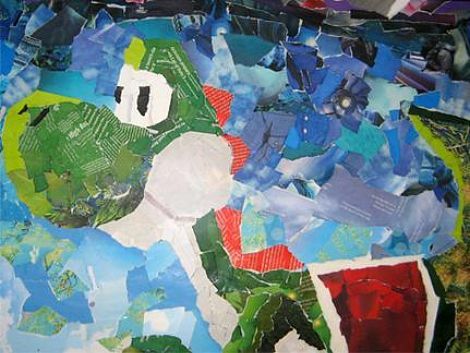 if you do as well, you will appreciate the cool and colorful collage artwork of washington dc artist chris lange. 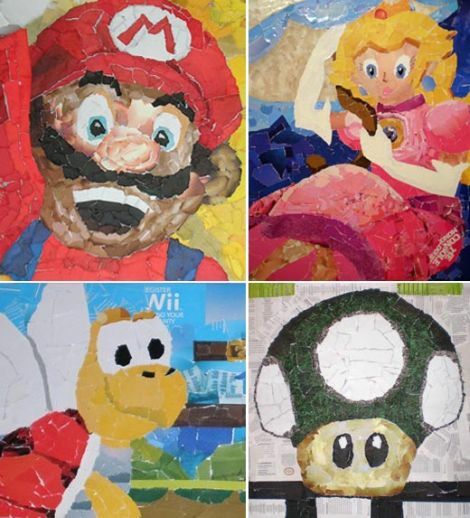 chris is a multitalented artist who makes really cool collages of his favorite nintendo game characters. his pieces are singularly unique because he uses tiny pieces from old copies of nintendo power magazines to create them! now you can be the proud owner of your very own original mini collage of your favorite character by entering the contest to win one over at technabob. all you need to do is leave a comment describing your favorite nintendo memory in the comments section by march 31st, 2008. the winners will be those who wrote the most enjoyable entries. the winner will receive an original piece with the character of their choosing, and five other winners will receive an 8″ x 10″ print of one of chris’ most popular pieces. see more of chris’ portfolio on his website and see his current watercolor washy-looking works for sale at his etsy shop too. enter the contest (which is on like donkey kong) over at technabob.